Congrats to the Goose. . . for making it to Cooperstown. Shame on whoever voted for Brady Anderson, Shawon Dunston, Chuck Finley, Robb Nenn. . . Sorry, but Andre Dawson, Jim Rice, and Dale Murphy ought to be in, IMO. I'm not sure 'bout Bert. Wasn't he in the same rotation ( for the Angels ) at the same time as Ryan & Tananna(sp). . .I vaguely remember Monte Moore calling A's games on the radio and those 3 guys were hella on back-to-back-to-back nights. . . Goose should've gotten in years ago. The voters have turned this HOF into a joke. Jim Rice wasn't nice to reporters so now those pouty ####ies will teach him a lesson, boy. I agree - Goose should have been voted in sooner. He didn't need any lead in songs to generate crowd excitement - all it took was for him to start warming up in the bullpen. I ran into him in a Mission Valley bar one time, just after a Padre game was over - it was just after then owner Joan Kroc had banned beer in the clubhouse. He spoke his mind to the press - "She won't let us have beer in the clubhouse, but she is poisoning the world with her cheeseburgers". I love it when an old Padre gets into the hall! Even if he only played in SD for 4 seasons. This guy had one of the greatest facial hair looks ever! 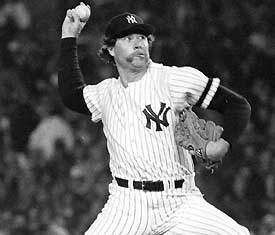 I don't even care if Gossage never threw a pitch, the stache is stuff of legend! He still has that same legendary stache. A 287-250 record does not cut it. He won 20 games once.